Remember, hacking is more than just a crime. It's a survival trait. “This is our world now... the world of the electron and the switch, the beauty of the baud.” During a rare quiet moment in Iain Softley’s rambunctious 1995 film Hackers, a Secret Service agent sits in a car on a stakeout, reading a section of The Hacker Manifesto aloud. Written in 1986 by The Mentor, the essay was as fundamental to hacker culture in 1995 as it is today. It’s also the philosophy that runs through Softley’s hacksploitation flick and cult phenomenon, starring the fresh-faced and soon-to-be-wed Jonny Lee Miller and Angelina Jolie. The early moments of the film establish the antagonism of the story with a bang: the Secret Service knocking down the door to arrest eleven-year-old Dade Murphy on charges of hacking. After he has been whisked away in a slow-motion flurry of flashbulbs and credits, we next see Dade in the air, staring down at the narrow streets and wide avenues of Manhattan, gliding towards a new life and one hell of a MacGuffin. The soundtrack to the scene is the blissful and wordless “Halcyon & on & on” by Orbital, one of the most gorgeous songs of the ’90s and a classic of the era. Propelled by Kirsty Hawkshaw’s ethereal vocals and that unshakable bassline, the track carries Dade and the viewer forward as the familiar forms below shift from city into circuitry. Here it is: the world of the electron and the switch. Cooler than our own. More vibrant. With more rollerblades, pleather, and ugly red books that won’t fit on a shelf. Where you don’t have an identity until you have a handle, man. 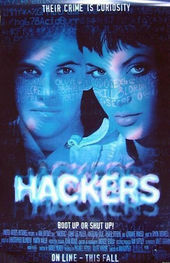 For a generation coming of age in the mid-’90s whose moms actually did buy them a ’puter for Christmas, Hackers was an intoxicating elixir. It was a raucous combination of cutting-edge graphics, electrifying soundtrack, flashy cyberpunk costuming, terrific supporting cast, and keen attention to detail, with references to everything from Metropolis to Boy Meets World. Though critics glommed onto its slang-laden dialogue and computational kitsch immediately upon release, its aesthetic endears and the film endures in part because of its sly intermingling of the familiar and the unknown, of past and future tech. It predicted the rise of the Internet, the demand for streaming services, and the importance of open access to information. It tapped into a real counterculture that over the last 20 years has become increasingly sophisticated in both technique and technology. We may no longer have ubiquitous payphones, floppy disks, or our tapes of The Greatest Zukes Album, but we have the Internet, and therein lies Hackers. It’s in that place where I put that thing that time. A discussion with Title Designer RICHARD MORRISON. So it’s been 20 years since Hackers first hit theatres. What’s your relationship with the film been like since then? It’s one of those films, when I’m teaching and stuff, a lot of youngsters ask about it because it’s obviously turned into a cult film. Did you have any idea that that’s what would happen? No, none at all. None of us realized what was going to be happening with computers at that time. We were still doing so much work in analogue. What was the first meeting about this project like? How did you discuss what you would do? 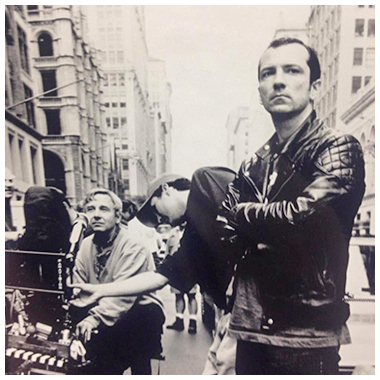 Director Iain Softley (right) and Director of Photography Andrzej Sekula (left) on the set of Hackers. Meeting Iain [the director] was really fun. He’s just a really nice guy. First time I met him. And he was quite relaxed, he was really relaxed. I remember going to his flat because he was living down in Knightsbridge somewhere and we discussed it together, and then he let me go away and come up with the fonts and the sort of look. Then we discussed this idea of starting with the city… and then mixing through to the cyber-city. Was the title treatment at all described in the script? No, no, there wasn’t anything like that. I think it just opened up straight away on the city and that was it. I don’t think it gave any description of transforming across into the cyber-city… That just sort of came organically out of the way it was all put together. When you first started working on this, had you watched the film? Yeah, pretty well. I’d seen quite a lot of it with Iain, definitely. I did a little bit of homework, thinking back on it this morning before our chat. What we decided to do with Iain Softley is – for the splitting logo – what we did is we shot that on a rostrum camera. We shot the separate passes on a rostrum camera – because then CGI and all the technology was just kicking off. I’m pretty sure we went on and did it on a piece of Quantel equipment called a Henry, which is a digital compositing effects tool. When Paintbox came out, Quantel very quickly bought out an editing software called Henry and I’m 99% sure that we did the title effect on a Henry to composite it together over the cityscape. How did you create the colour effect on the title itself, the halftone effect on that? Yeah, that was in the artwork. What I did is I shot negative transparencies. So what I had done is I had them separated and I shot them all in different positions. So that when we took them into the Henry suite, Iain and I had flexibility in how to move those separate layers. It’s like an early form of [digital] animation, if you like, that we shot on a rostrum camera. We had the moves already shot, and it was just a matter of taking those layers into the Quantel Henry. Now, obviously, you have Flame and Combustion, but the Henry was the first one of all of those sorts of pieces of the kit. Did you choose the colours – that red, green, blue – with screen colours in mind? Yeah, exactly. You’ve got it. I chose all the colours for the split of the title. Let's talk about the music a bit. Did you have that track, "Halcyon & On & On" by Orbital, while you were working? Yeah, because I remember going to Pinewood Studios. The sound playback was done up there with Iain Softley and myself, and I’m pretty sure the Orbital people were there. For the cyber-city, how was that created? Iain did that with some models. He had modelmakers make blocks, and then they did a version of early CGI work. I’m pretty sure it was shot on a motion control rig. I mean, honestly the way things have changed is ridiculous! The blocks were made of perspex, and then I think cels were added to those perspex blocks, and then they were shot in position so that you got the scale. I’m pretty sure that’s how it was done. And then I think the CGI was just the mapping around of all the layers, the colours. It was pretty amazing. Twenty years ago, we were constantly always doing two things – analogue and digital – at the same time. The crossover hadn’t totally happened. For a movie that’s so digitally-focused, it’s amazing that so many of the effects are practical. Yeah, I know! It was quite a groundbreaking film, in a way. Do you think there’s a place for these kinds of practical effects in modern films? Definitely, but because every film is a unique piece, it just needs the right people in order to execute that kind of thought process. You need people buying into it from the start. Also credited in the title design on the film was Plume Productions. Is that a company you were with? I owned Plume, that was my company at the time. I thought so, because there seemed to be a lot of overlap! [laughs] Plume was a company I owned then. You see, 20 years ago we needed more staff because so much of the work was analogue. Now you don’t need so many designers working with you full-time. Yeah, it is. But back then, you needed a lot of hand artwork. So our company had about 15 to 16 people in there. It lasted 12 years. The thing is, the title sequence work moved away a bit in the early ’80s. There wasn’t so much of it around, and we concentrated on doing brand identities and more TV work. The features picked up again in the late ’80s, ’90s. There was also an optical house involved in the titles, right? Capital FX? Yeah, they’ve gone now. That would have been to do with all the graphics on the end. Would they just have done the overlays at the end? Yeah, they likely did all those overlays. I don’t remember passing the front sequence on to them – I’m pretty sure we did it all in the Henry – but there might have been some compositing. You see, Capital FX would have been involved because still, then, there was an output of 35mm negative, obviously, so the grading of the film might have ended up at Capital FX. Now that it’s been 20 years, when you look back at the film and your work, how do you feel about it? God, that’s a tricky question. It seems like now, because we’re discussing it, it sounds like it’s come back now. I think the overriding thing is the technology. I remember when I did that first Batman sequence with Tim Burton, that’s all analogue, you know? It’s motion control, it’s a huge great model, it’s a proper filming job, big back plates, la la la la la! You’d never do it like that now. You wouldn’t do it the same way, because costs have come down so much as well. Hackers was a bridge. Twenty years ago, it was definitely a bridge between analogue and digital. It’s fascinating looking back at these things. Right. How they’ve aged, what they mean in retrospect. Exactly, and so many of these things just get reborn, because another generation finds them. 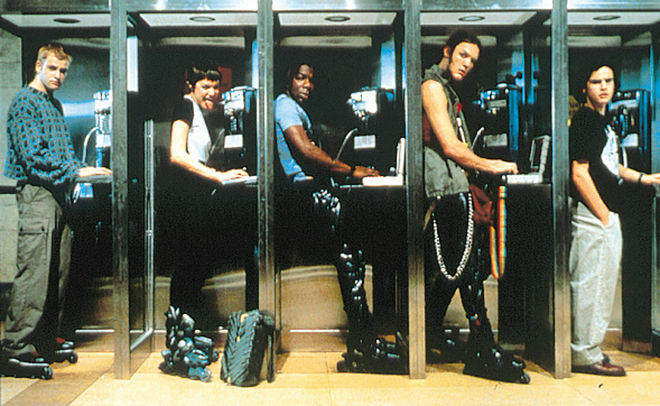 It’s nice to think that in a way, Hackers is a movie that can’t be remade. Mmm! Yeah, that’s true. It was so much of its time. Exactly, it’s so much a part of its context that I don’t see it working in any other way. At the time, we had a Quantel Paintbox in the studio, so we very much understood the whole change, in the way things were gonna be produced. 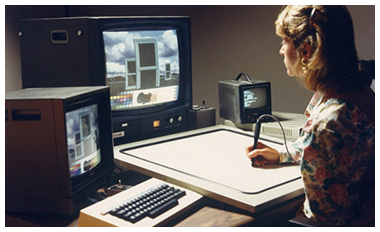 We were one of the first people to have a Quantel Paintbox in London, under the Plume banner. Crazy now, when I think about it. I had to half-mortgage my house in order to get it, I think! It was crazy. And you had to dedicate a room to it, didn’t you? It’s quite big! Title Design: Richard Morrison, Plume Productions Ltd.
"Halcyon & On & On"
KEEP ART OF THE TITLE PUBLISHING GREAT FEATURES. BECOME A PATRON TODAY.